Alfred was initially victorious and then defeated. He fled to the marshes where the story of the burnt cakes arises. From there he began a fight back that drove the Vikings out of Wessex and established him as King of the Saxons. DESCRIPTION: Saunders and Duff make an effective presentation team. These former soldiers bring to the story an eye for the land that is as important today as it has always been in land warfare. 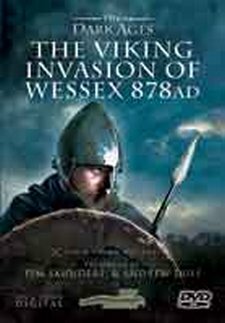 In presenting the story of the Viking Invasion of 878AD they are delving into one of the critical points in British history that is very poorly documented. The collapse of the Roman Empire left Britain without strong defence against invasion at a time when the Germanic and Scandinavian people were expanding out from their homelands. The nuisance raids of the final years of the Roman Empire steadily increased and the Angles, Saxons and Jutes began to colonize the British Isles, leaving the indigenous population only, Ireland, Wales, Cornwales to the West and the Pictish lands to the North. The Saxon period saw the division of the rest of the British Isles into a number of Saxon Kingdoms that began to convert to Christianity. The start of the Dark Ages covered a period from the ending of Roman occupation into the Middle Ages. During this period, there were few records to survive to modern times. An event that is remembered by many Britons today is the tale of the Burning of the Cakes. It is an event that may or may not have happened but it is the memory that has survived into folk law in respect of Alfred the Great. Although fragments of history have survived, they have often been Saxon propaganda, written some time after the events they record. Even the location of key battles is hotly debated. The presenters apply military logic and experience to an examination of the events that led to the basis on which England was built as a nation and the first Royal Navy was created in defence against invasion from the seas. Alfred was young at the time of the Viking invasion and logically his older brother should have led the fight. Alfred was initially victorious and then defeated. He fled to the marshes where the story of the burnt cakes arises. From there he began a fight back that drove the Vikings out of Wessex and established him as King of the Saxons. For his times, Arthur was very well-educated and could be regarded as a scholar, rather than as a military leader. Some versions of the history suggest that he was in the process of becoming a priest or a monk. He was undoubtedly a complex character living in uncertain times and rising as a warrior king, defending his home against invaders. By blending maps, commentary and living historians, the presenters offer a colourful and entertaining review of the period and the events. Their presentation is credible although some will question the views and conclusion because this important period has been interpreted many times by many people attempting to fill in the large gaps that exist in our knowledge of the Dark Ages.